Which Elves are the men of Bree familiar with? The Men of Bree were brown-haired, broad, and rather short, cheerful and independent: they belonged to nobody but themselves; but they were more friendly and familiar with Hobbits, Dwarves, Elves, and other inhabitants of the world about them than was (or is) usual with Big People. The above passage states that the men of Bree are friendly with Elves. Is this a throwaway statement saying that the men of Bree do not hate outsiders and are generally friendly with strangers, or is there any evidence of Elves actually visiting Bree? The Elves who travel the East Road - particularly those from Rivendell. The traditional business of Bree was catering to travellers. Bree is at the crossroads of two ancient highways; the East Road from the Grey Havens to Rivendell, and the North Road from the Gap of Rohan to Fornost (the one-time capital of the North Kingdom). For Bree stood at an old meeting of ways; another ancient road crossed the East Road just outside the dike at the western end of the village, and in former days Men and other folk of various sorts had travelled much on it. Strange as News from Bree was still a saying in the Eastfarthing, descending from those days, when news from North, South, and East could be heard in the inn, and when the Shire-hobbits used to go more often to hear it. But the Northern Lands had long been desolate, and the North Road was now seldom used: it was grass-grown, and the Bree-folk called it the Greenway. The Inn of Bree was still there, however, and the innkeeper was an important person. His house was a meeting place for the idle, talkative, and inquisitive among the inhabitants, large and small, of the four villages; and a resort of Rangers and other wanderers, and for such travellers (mostly dwarves) as still journeyed on the East Road, to and from the Mountains. As the quote explains, this business had declined considerably by the time of books, but the Prancing Pony still seems to welcome the few who still travel the highways. Elves who are travelling between Rivendell and the Grey Havens would travel through Bree and it seems quite reasonable that they would interact with the men of Bree who invite the business of travellers. That seems reason enough for the men of Bree to be said to be familiar with Elves. The same may not apply to other settlements (such as the Shire) along the East Road where the inhabitants are not interested in catering to travellers. It is likely that the Elves would avoid interacting with the inhabitants of those areas. Elves were frequently travelling from Rivendell to the Gray Havens - a journey that has Bree pretty much as the halfway point in a straight line. In Chapter 3 of Lord of the Rings, Frodo and company encounter Gildor Inglorion and his band of elves, returning back to Rivendell after a pilgrimage. 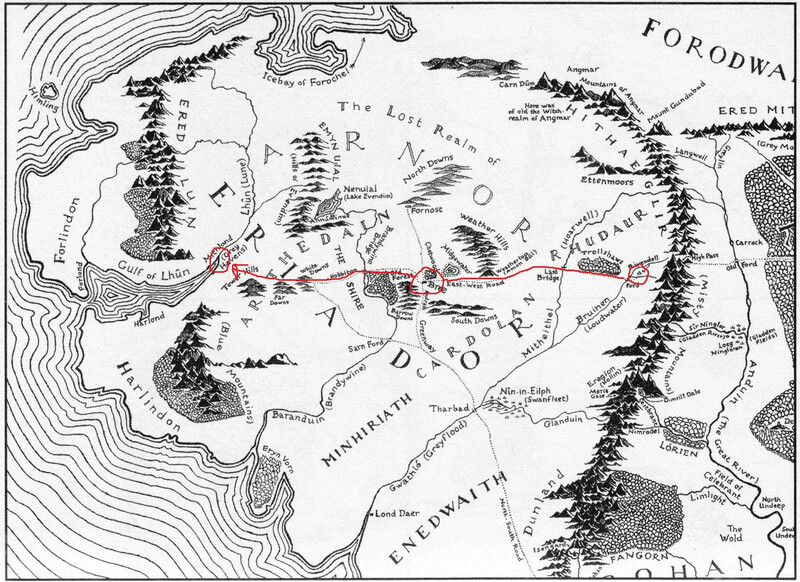 It is very likely that these elves would pass through Bree on both directions of their journey. Are the men in the pub at Bree who eye off Thorin 'men-orcs'? Are the Elves Aware that Gandalf (Etc.) Are Maiar? Why are Frodo, Sam, Merry & Pippin going into lands “wholly strange to them” when leaving Bombadil? How tall are Tolkien's elves?